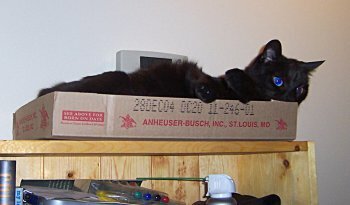 Our cat Ivan died of kidney failure on September 15th, 2007. We’d known for some time that it was coming, but he had been managing pretty well with subcutaneous fluids and a restricted diet. I got Ivan and Alexi (who died a little over three years ago) at the Portland Animal Shelter in 1993, and they travelled up to Alaska with me in the Volaré. He was a very playful cat and had learned to play fetch. He’d bat a toy around on the floor for a little while, bring it back while meowing, and then flop next to the toy until someone got up to throw it for him. As he got older he became very affectionate, and whenever we were home he’d curl up on our legs. At night before bed, and in the morning when my alarm went off (sometimes before it went off! 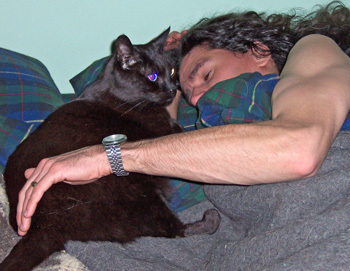 ), he’d come up on the bed, snuggle in close to my neck and purr and knead. It’s going to be hard to get to sleep tonight without him coming up to say good night. Good night little buddy. We’ll miss you.